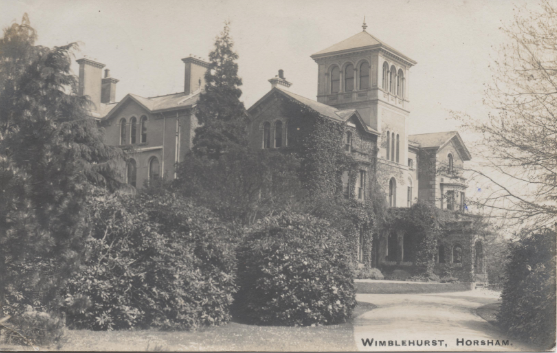 This site will be used to publish a history of the Allcard family (John Allcard 1779-1856), his son Edward Allcard (1822 -1900), and their children, together with a description of Wimblehurst House, Horsham. Edward Allcard lived in Wimblehurst House from 1883 to 1900. The house had been build in 1856 for John Braby, and was owned from 1871 to 1883 by Henry Padwick Jnr. After the death of Edward his daughters lived in the house. From the death of Ethel Allcard in 1952 the house was unoccupied. Despite many attempts by the family to redevelop the house it was demolished in 1963. The land on which the house itself was built is now Allcard Close. Some of the land owned by the family was sold off for housing development. However Novartis acquired a substantial proportion of the grounds of the house for a staff sports field but with the closure of the research site in 2015 this land was sold off for the Oaklands housing development. All that remains is a very large oak tree which can be seen from the road into the development, now named as Braby Drive.